Jack is a lovely lady with beautiful soft white fur with dark ears and tail. She is 6 years old and a real love. Unfortunately, my current move does not allow cats and I am looking to find her a new forever home as soon as possible. Jack is an extrovert, very curious and communicative. She will help you write an email and tell you what’s on her mind. 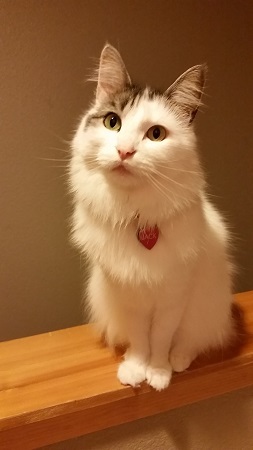 She has a cute pink nose. A water lover from an early age, she may peek around the shower curtain to inquire about joining you for a rinse. Jack loves to cuddle and can often be found napping at the foot of her human’s bed. Even though she is socialized with both cats and dogs, she would prefer to be an only. Jack is happiest when able to be both inside and outside. She is spayed and up to date with all shots.